I am trying to build a small solar furnace and I thought it would be fun to make it track the sun. I'd like something that would move the oven toward the sun's position by driving two motors (servos, stepper, etc. ): one for the base rotation and the other for elevation. Do you know of a simple design that won't take a rocket scientist or NASA-like budget to build? Over the years, I've built and/or tested many different kinds of sun trackers, each with its own merits — and price. Here's one I designed myself that's very reliable and inexpensive. It uses but a handful of electronic components and a single, garden-variety motor. The brains of the design is a pair of phototransistors, like the RadioShack 276-145. The heart of the circuit is Q2, a 2N2222A transistor, which is basically a relay driver. When the transistor is conducting, the relay, a normally-open reed relay, pulls in, which starts the motor. The two phototransistors give the relay driver some brains. Disregard Q1 for the moment. 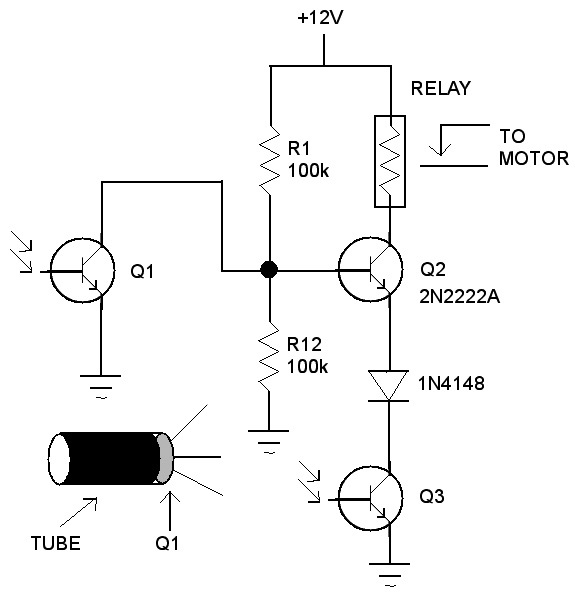 Q3 is in series with the emitter of Q2 and behaves like a variable resistor. When the photoresistor is dark, its resistance is high and very little current flows through Q2; so little, in fact, that the relay can't pull in. As light begins to fall on Q3, the transistor starts to conduct. At some point the current flow is enough to engage the relay. This photo sensor is used to determine if there is enough sunlight to warrant tracking the sun, and prevents the motor from running at night. Q1 is the actual positioning sensor. When Q1 is dark and Q3 is bright, the relay is engaged. When light falls on Q1, it begins to conduct, which shorts out the base of Q2 causing it to turn off along with the relay. Q1 is housed in a short cylinder so that only light that hits the photo sensor straight on will trigger this process. Light off to the side of the perpendicular axis can't enter the cylinder. Let's put this into a real-life scenario. First we have to assume that Q3 is unshieded and has full access to ambient light — which it does. As the sun comes up in the morning, the current through Q3 will begin to flow; the amount of current is proportional to the amount of light. After the sunlight is intense enough to do useful work, the relay engages and starts the motor. This point is determined by the value of R1, which has a nominal value of 100k. A potentiometer can replace R1 to adjust the trigger point. The motor will continue to run until light falls on Q1, causing Q2 to turn off. If Q1 is mounted on the rotor mechanism, this will occur when the solar tracker is pointed directly at the sun. As the sun moves across the sky, it will cast a shadow on Q1, which turns the motor back on to rotate the tracker. And so it goes until the sun sets at night and the tracker goes to sleep. The next morning Q3 awakens everybody and it starts all over again. 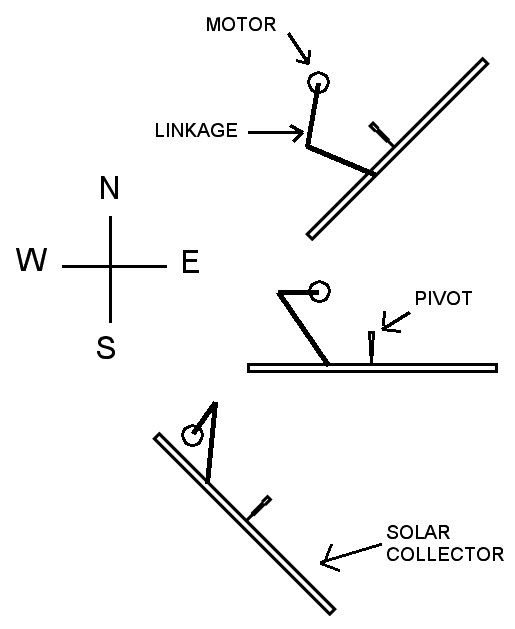 Most solar trackers use limit switches that reverse the direction of the motor when it reaches the ends of its sweep. Unfortunately, bi-directional motors are not easy to come by and are costly. My solution is a cam assembly that lets you use any low-speed motor. Be it AC, DC, or a hamster in a cage, it doesn't matter. All you have to do is start and stop the motor when the controller says so as the sun chariots across the sky. The amount of sweep is adjusted by the size of the cam and the position of the link rod. This will vary from project to project depending on the physical size and weight of the solar collector. No provisions have been made for azimuth adjustment (up/down) tilt, only the horizontal sweep. That's because the azimuth angle changes very little from day to day, and it's easily adjusted manually to compensate for the seasons. Yes, this design does require some customizing in both the ambient light level and the east-west swing, something the expensive commercial units do for you. But it's well worth the bucks saved.